A good attempt on a familiar core design but needs further refinement. The Manfrotto PL-3N1-36 Pro Light Sling Camera/Drone backpack is a rather large, good looking backpack that feels light due to the materials it has chosen to use. It looks well designed and well built from the surface based on its colors, materials and the overall feel of the bag when you handle it. But after closer inspection, and loading it with the gear I plan to use it with, I noticed many disappointing flaws. Before I decided on purchasing the Manfrotto backpack, I first outlined a list of requirements that I would like the backpack to meet. Large backpack that is within carry-on specifications of 56cms x 36cms x 23cms, that could fit a camera, lens, Mavic Pro drone and various accessories. Top opening to access a camera. Full front or back entry. Cube like exterior body shape to maximise interior space. Good quality materials and stitching that is durable. In general, most camera backpacks I have researched online such as Ebay, Amazon, YouTube, Gumtree, B&H Photo, AliExpress, online reviews, various online stores, etc. have similar core design. They are either any of the following combinations of top opening, side openings, front opening, back opening, front or side tripod attachments, etc. and due to this, choosing the right backpack can be a little daunting. To makes matters worse, you also need to consider other important factors like size, how it fits to your body, flexibility of the inner compartments and dividers, durability and quality of materials and stitching used, functionality and features, etc. which can make it difficult if you are mostly researching your ideal bag online. I decided to purchase the Manfrotto backpack based on its reputation and large size, with consideration that I may use it for travel. My only concern was the 28cms depth of the bag as it exceeds carry-on dimensions of all the airlines I have used so far. 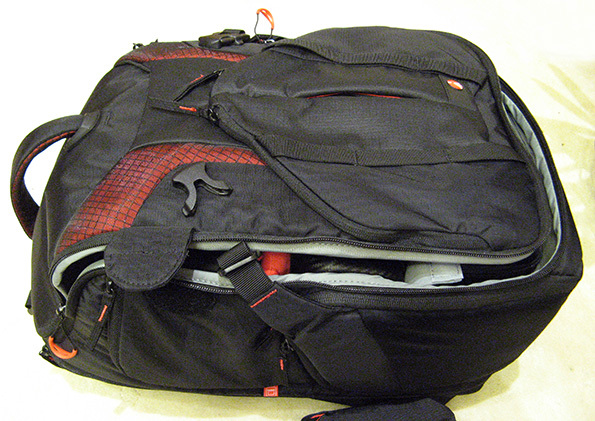 Most airline restrictions are for a depth of 23cms or 25cms but I considered the possibility that I may be able to squeeze the depth smaller by ensuring no items are stored in the front, if the bag has to be measured at the airport using those drop-in carry-on measuring frames. I was re-considering the Lowepro Protactic 450 DSLR backpack before deciding on the Manfrotto, as it was only about $35 AUD more, at the time of my research, but decided not to, due to the poor experience I had with the imitation. By design, the Lowepro Protactic 450 camera backpack has thin shoulder straps which could possibly lead to poor durability. I do not believe the Protactic’s light padding on the back support and shoulder straps would make it very comfortable to use when the bag is fully loaded with my equipment. This review will not be focusing on describing all the features and functions of the Manfrotto 3n1-36 DSLR/Drone backpack but rather on the distinct Pros and Cons that I found. A good looking backpack that looks well designed and well built from the surface but after closer inspection, the backpack has many flaws that I would not have expected from a brand such as Manfrotto at this price range. The backpack seems to be based on a familiar core design but somehow it has not managed to improve on it effectively with its attempt on clever features and functionality.